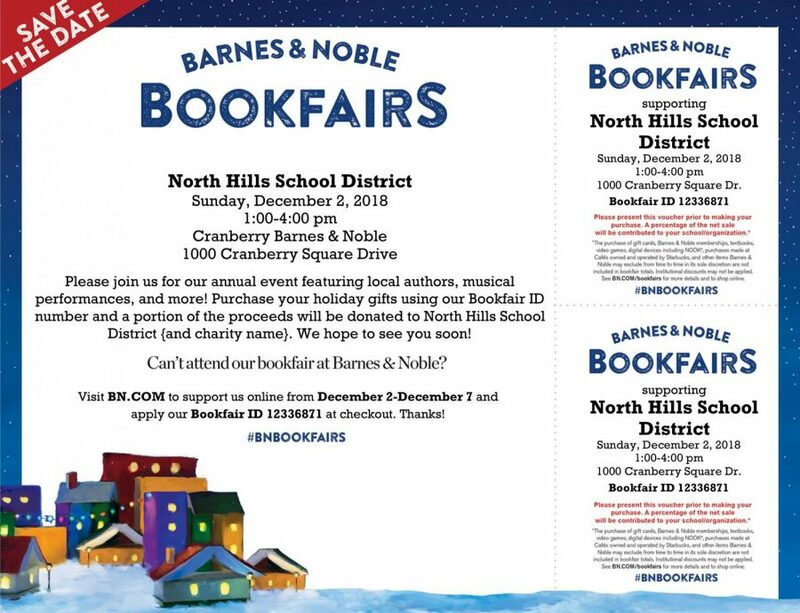 The fifth annual Barnes and Noble Bookfair supporting North Hills School District is quickly approaching. The event will take place on Sunday, December 2 from 1-4 pm at the Cranberry Barnes & Noble. Come get a new book with live music and poetry. North Hills guitar players will kick off the event with their six-strings at 1 p.m., followed by Mr. Franks reading original poetry at 1:30. Starting at 2:00, Ms. Sarazen’s acting classes will be reading stories in our “Children’s Corner.” The strings ensemble performs at 2:30 and the North Hills Singers will start off their holiday performance season at 3:30. Authors Natasha Garrett, Joshua Bellin, Dorit Sasson, and Ellen Roth will be in attendance to meet guests. Sponsor Mrs. Washington said that students should come to the Book Fair because “It is always a community event that reaches out. It gives us an opportunity to hang out with one another and just be people. It’s a quiet atmosphere of fellowship and fun. The biggest draw is the North Hills students are able to perform and showcase in a place that is available. It gives us exposure to the community that we wouldn’t have, and it’s a community effort to raise money for a charity.” Be sure to come out and support at the fifth annual North Hills Book Fair. Hope to see you there!